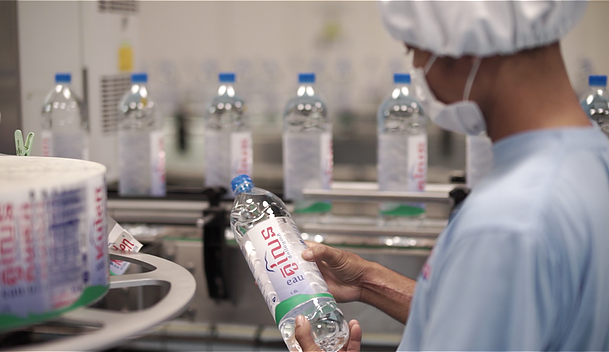 Eau Kulen is bottled directly at the source in a brand-new, state-of-the-art bottling line facility northeast of Siem Reap Province, Kingdom of Cambodia, under stringent international standards. No chemical treatment is used in order to preserve the finest taste and health benefits of pure natural mineral water. The entire bottling system of the Eau Kulen factory has been designed and fully automated to preserve the water’s natural qualities. It takes a short period of time for Eau Kulen to be drawn in a stainless-steel pipeline from deep inside the Kulen mountain aquifer to a sealed environment inside the bottle. Bacteriological analysis are carried out all along the process and every day in a well-equipped laboratory. Mineral composition is also controlled very regularly. The production process of Eau Kulen natural mineral water follow the GMP* and HACCP* strict procedures, and this certification is carried out each year by TUV Rheinland, Germany.